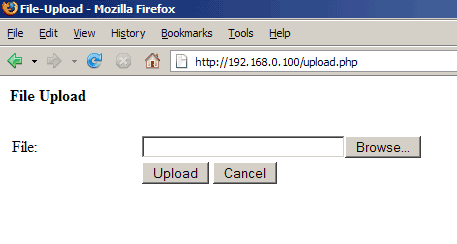 We will now create a small upload script, /var/www/upload.php, which contains an HTML upload form. 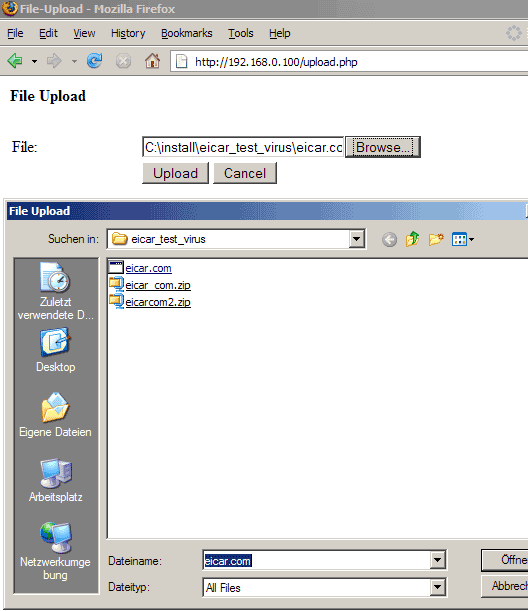 If you submit the form, the script will call itself and use cl_info(), cl_scanfile(), cl_setlimits(), and clam_get_version() to scan the uploaded file for viruses. If the file is ok, it will be uploaded to /var/www/uploads, otherwise the script will display an error message (saying which virus/worm etc. it found) and delete the file on the server. Details about the uploaded file are saved in the $_FILES array, so we use that to check the file (you can uncomment the print_r($_FILES); line to see what is stored in the array). Basically, these values define the behaviour of ClamAV if archives (zip files, tar.gz files, bz2 files, etc.) are scanned. If you don't use the cl_setlimits() function, the respective values from the php.ini are taken. The main function is the cl_scanfile() function which takes the path to the file to scan as argument. Uploaded files are temporarily saved (usually in /tmp; depends on your php.ini settings) before they are processed. That temporary file is saved in $_FILES['file']['tmp_name'] so we pass that variable to the cl_scanfile() function. If no virus is found, it gives back FALSE, otherwise the name of the virus it found. clam_get_version() doesn't take any argument. That function gives back the version of the installed ClamAV (like 0.88.4). Finally I use the function cl_info() which - like clam_get_version() - doesn't take any argument. 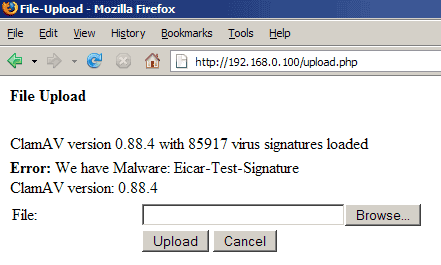 It displays more detailed information about ClamAV, for example ClamAV version 0.88.4 with 85917 virus signatures loaded.